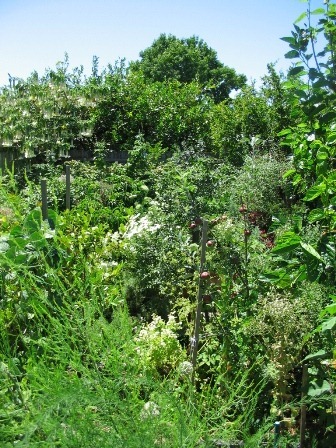 It’s been a while since I’ve reported on the garden, and there’s definitely been a lot happening from October 2011 to June 2012! We saw a whole range of extreme weather conditions, had some unfortunate incidents, and received many pleasant surprises too. 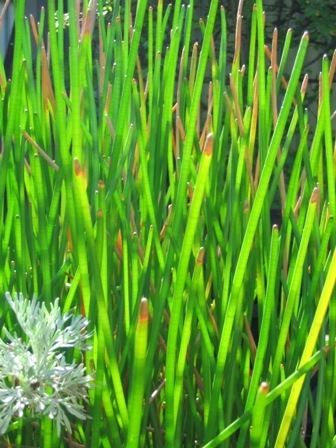 Spring brought pleasant skies and lots of healthy green growth. 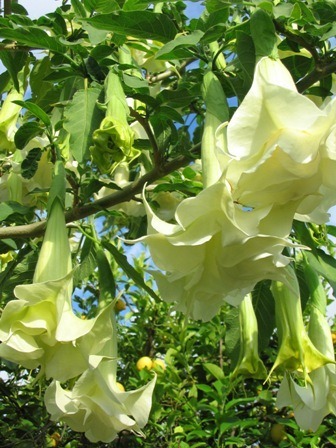 Large fragrant flowers of Brugmansia x candida ‘Double White’ (Double White Angel’s Trumpet). 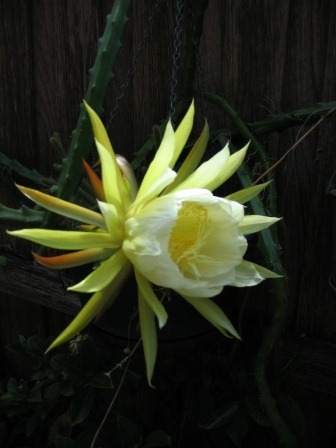 A fragrance that is strongest at night and bright white flowers are a feature of flowers pollinated by moths at night. It was a great year for berries, one of the recent additions to my berry collection, the youngberries fruited for the first time. A youngberry is a cross between a raspberry, blackberry, and dewberry. This variety has thorns, the thornless youngberries are supposed to be less productive. Three of these plants on a 5m wire trellis yielded 3kg of youngberries in their first year of fruiting, a very productive brambleberry in my opinion, considering they achieve their peak production levels after three years. I’ve also added a thornless youngberry to the garden rather late in the season, it is still growing and will produce its first fruit in the following summer. It will be interesting to compare the productivity and flavour between the two varieties. These berries collected were collected in one single morning, these are big lunchbox sized apple containers, everbearer raspberries in the centre, and youngberries left and right. Just as all the new growth was looking very pristine and lush, one of those crazy Melbourne freak weather changes struck. 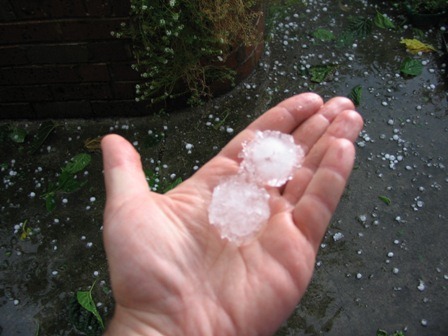 In late January we were pelted by huge hailstones. In some suburbs hailstones big as golf balls smashed car windows and dented steel car panels to the point where they were written off. In our area, we were fairly fortunate, the hailstones were a bit smaller and only managed to shred most of the large leaf plants to pieces. They put some big dents in the young apples too, but it could have been worse. 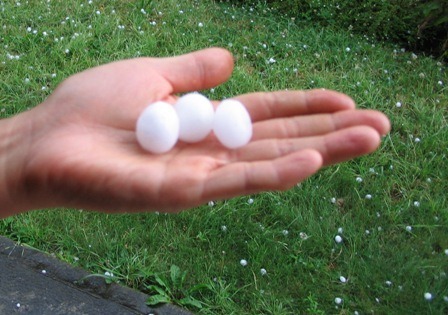 The first round of hailstones were large and smooth, as pictured below. 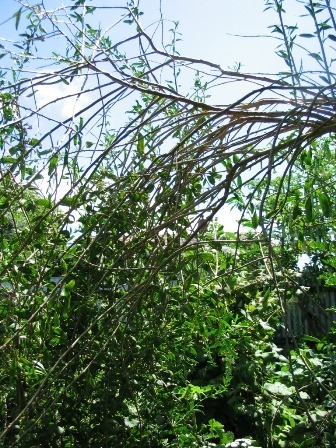 The second round brought even bigger nasty jagged hailstones that shredded foliage even more viciously! 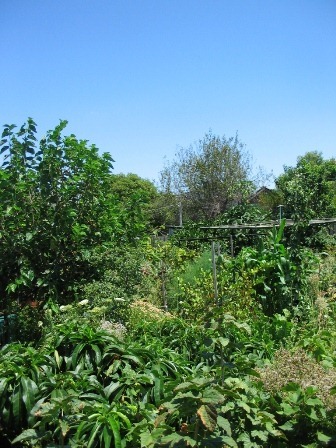 A food forest isn’t a metaphorical reference to an abundant produce garden like some people imagine, it’s a literal description of a living ecosystem with all the layer of a real forest, which functions just like one. 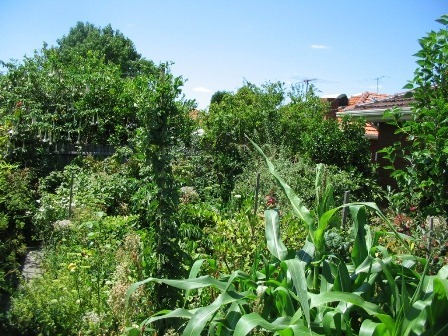 This is what a small backyard food forest that is just over three years old looks like in summer. 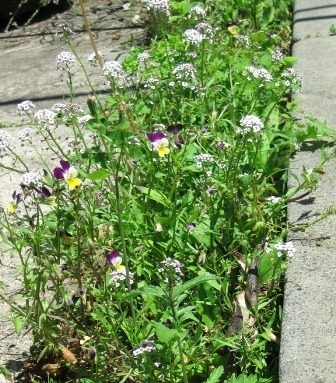 French drain in concrete catches water and seeds too, self seeded violas and alyssum in flower. Night Blooming Jessamine or Queen of the Night (Cestrum nocturnum) in full flower, a 4m tall shrub , this member of the Solanaceae family produces a very strong lovely sweet fragrance at night. A Wormwood plant (Artemisia absinthium) is growing below it. Goji berries (Solanaceae family once again) ready to pick! 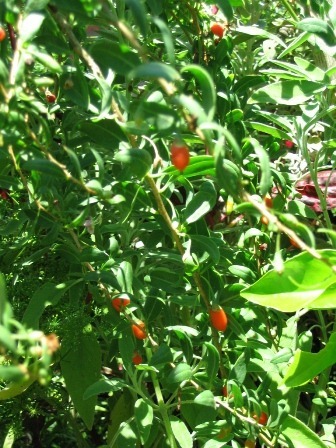 Goji berries have long, thin, untidy branches as you can see here. Luckily, I discovered that they can be pruned into a single stemmed small tree. 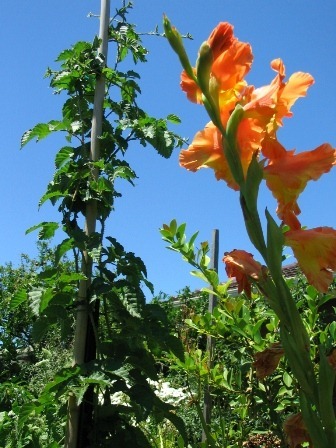 Gladioli flowering in the foreground, with another new berry added to the garden recently, a loganberry, climbing up its support. 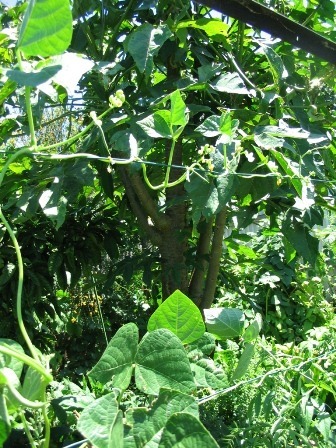 Remember the fig tree with the fruit growing to size a few pictures back. Well, disaster struck once again. This time powerful winds tore the trunk from the side of the old stump it was growing out of. 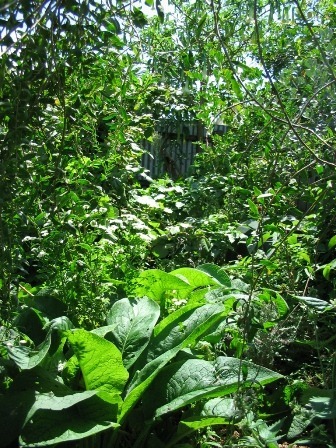 The fig tree was coppiced (not something I had done! 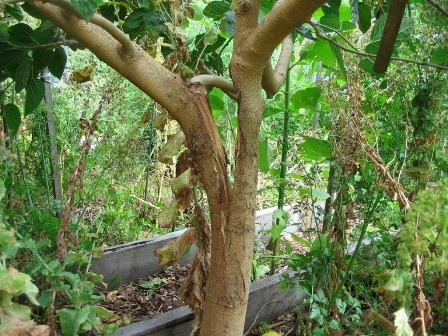 ), and regrew an new trunk which I patiently trained into a large 3m tree over two years. The wind wrenched it off, loaded with fruit. As I cut up the whole tree and mulched it, I filled four buckets with unripe undersized golf-ball sized figs. Unfortunately, this was one of my three biggest trees in the garden, and provided shade from the harsh west sun. This is the fig tree, lying fallen across the lawn, luckily, nothing else was damaged when it fell. The top of the tree canopy was resting on the trellis wires of the youngberry. Good thing I constructed a sturdy trellis, I just had to re-tension the wires afterwards. It’s always a good practice to propagate your favourite plants, to give away to people, and to have spares in the case of emergencies like this. 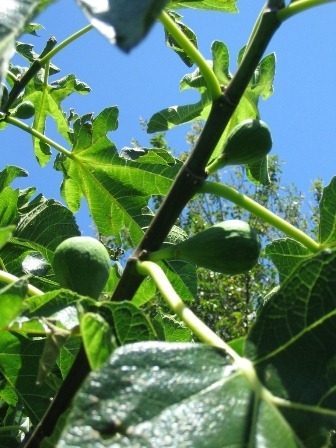 Figs can be propagated very easily from cuttings taken from dormant wood in winter. 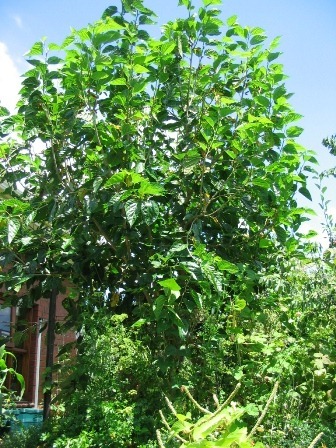 A year earlier I had taken a cutting of this fig tree which I was training into an espalier in a pot. I was able to plant this into the garden to replace the fallen tree. 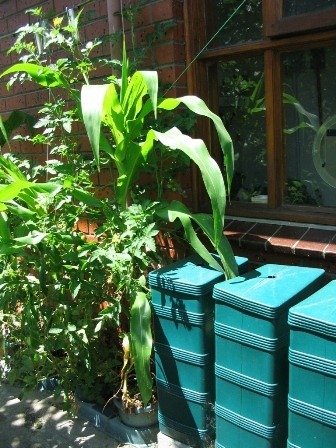 To get rid of the old stump, I placed a compost bin over it, and filled it up with garden waste to get the composting process running. 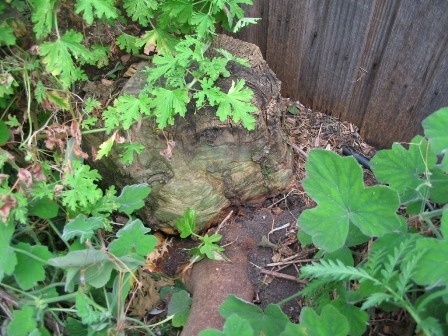 the stump should be rotted away within six months. After this, I also decided to put a second espaliered fig of a different variety that was in a pot into another part of the garden. The outcome of this disaster is that I now have two different varieties of fig in the garden, one I think is a White Adriatic, the second possibly a Brown Turkey variety. Back to the good news, the dragon fruit, a climbing cactus plant, flowered, so I pollinated the flowers with a soft artists paintbrush, and got to eat my first dragonfruit, and yes, they taste delicious! Since the summer gets hot, west facing walls get even hotter. 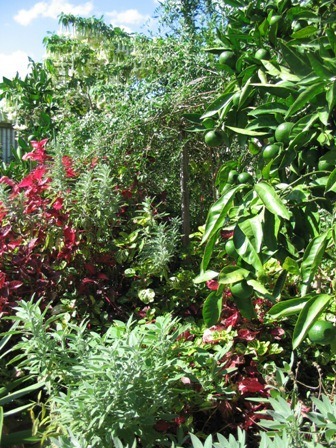 Vertical gardening utilises walls as extra growing space, and the plant foliage can shade the wall and keep the house cool in summer. 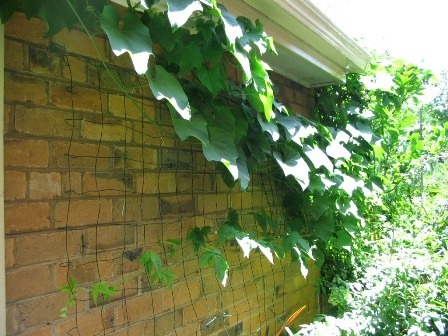 I’ve experimented with various plants growing hydroponically on the west wall, and I’ve finally had success with grapevines and climbing beans, as can be seen in the pictures below. You can see from the size of the bike in the picture above how high a wall these plants cover. 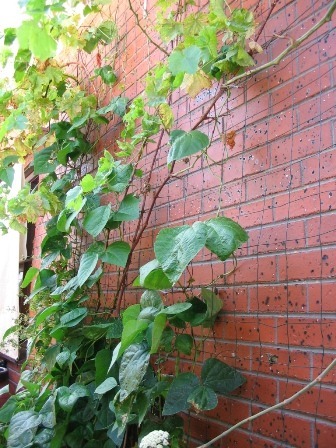 The trellis is a wide wire mesh supported 6” (15cm) from the brick wall. The gap is important to prevent the plant’s leaves getting burnt from the heat radiated from the wall behind them. if you doubt this, I used an infrared thermometer to measure the temperature of the top of the wall on a moderately hot 34 degrees Celsius (93.2 degrees Fahrenheit) day, and the wall temperature was measured to be a sizzling 47 degrees Celsius (116.6 degrees Fahrenheit)! 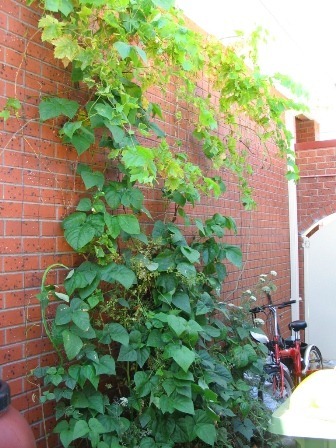 More vertical gardening, with a Choko vine up top with Hops vine growing and a Thornless Youngberry growing below it. Japanese blood plum (Mariposa) beginning to ripen. Very heavy bearing, with large fruit and excellent flavour. 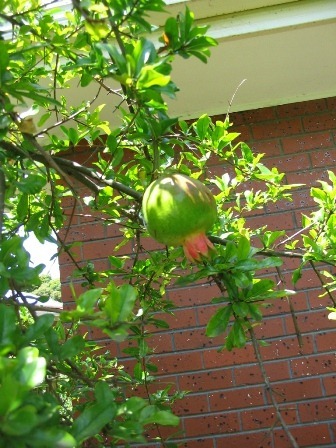 One branch tore off the tree from the weight of the fruit alone. 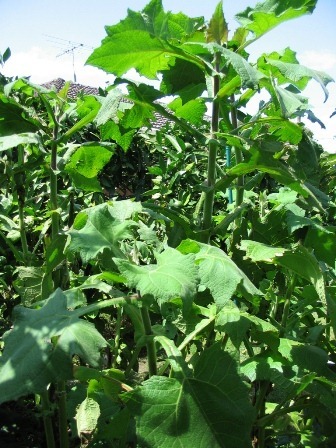 Yacon, a Peruvian root crop, reaching its full height of around 2m. Pomegranates beginning to ripen and turn red. 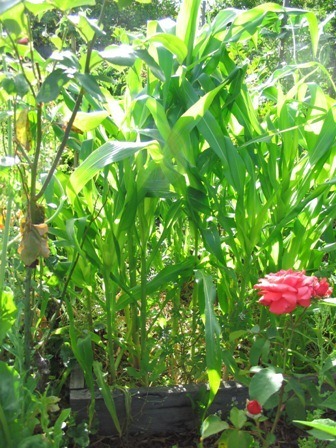 More experiments, hydroponic tall Balinese sweet corn – the organically grown ones in the garden tasted better and were more prolific. 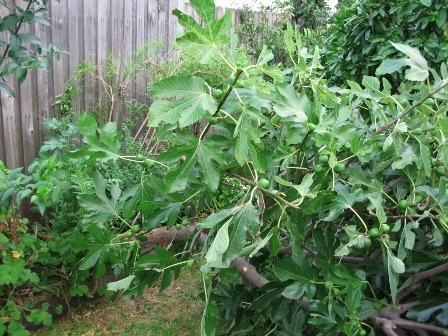 By mid February, another disaster struck, this time, 75km/h (46.6 mph) winds lashed Melbourne, and the mulberry tree you saw earlier, laden with its second flush of fruit for the season (it fruits twice a year) was split in half, literally. You can clearly see the trunk of the tree split in two in the picture below. The tree canopy reaching the height of the roof guttering, you can make out some of the red fruit, which ripens to a deep purple/black colour. There’s nothing as heartbreaking in gardening than feeding the remains of a tree laden with unripe fruit through a mulcher. This mulberry was the second of my tallest trees that succumbed to tragedy! Well, that was three disasters in a short span of time, the hail, the loss of the fig tree, and now the mulberry!!! Once again, I had taken several cuttings of the mulberry tree when I last pruned it, and had propagated several small trees. I picked the strongest looking one to replace the one I lost. Now I have to wait a year or two for it to grow to the same size though. 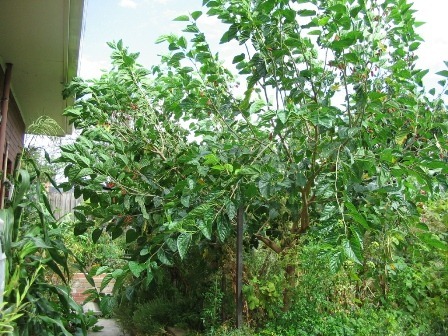 This time I think I’ll keep both the fig trees and the mulberry short, around 8’ (2.4m) like most of my trees. They’re less likely to fall over at that height. Once again, the weather was chaotic over the whole spring-summer period, with sudden extremely hot days in early spring that killed off a lot of delicate seedlings. 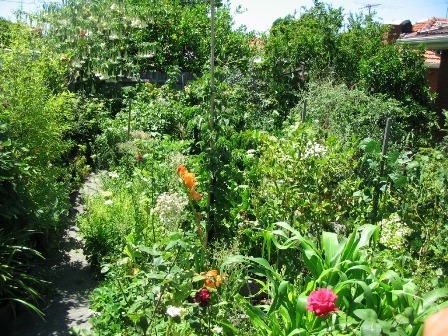 I lost nearly all my tomato plants from one of these days that would have been more in place in midsummer. Early summer was also extremely wet, very uncharacteristic weather for Melbourne, which has a hot, dry Mediterranean climate. The high humidity wiped out the grape vines for the second year running, fungal diseases run rampant with grapes in conditions resembling tropical weather. 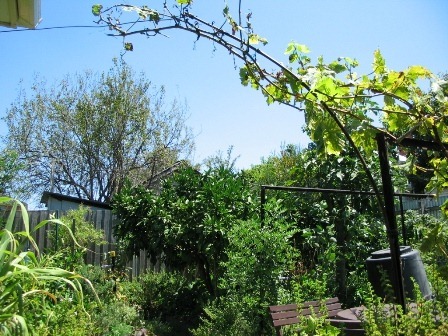 Gardeners everywhere in Melbourne that I’ve had discussions with had lost all their grapes for the second year running. The only successes were when grapes were grown under cover so they didn’t get wet, either under wide rooftop eaves, or under clear polycarbonate roofing. 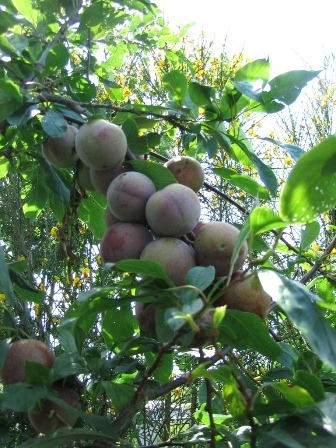 Stone fruit (peaches and nectarines) on dwarf trees didn’t fare too well either. 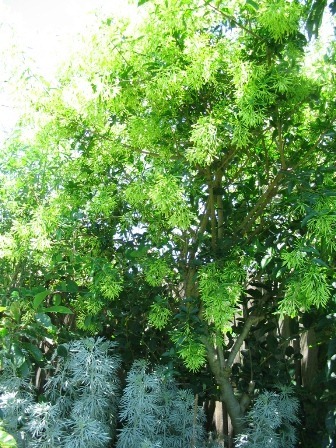 The buds are too close together on these dwarf trees and they create amazingly dense canopies which look sensational, but are terrible in very humid weather as there is little air circulation and fungal diseases run rife under such conditions. To remedy the problem, I’ve cut back these small trees to create an open canopy where air can circulate through freely. I will have to wait another year to see if this solution actually works. 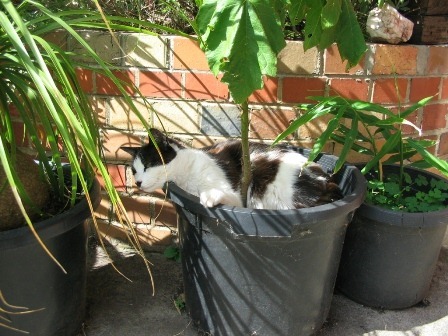 Gardening is a real practice in patience! Here you can see how I’m training my grapevine up a piece of bamboo, which has the bottom lashed to the trellis support post, and the top attached with a heavy wire to the house wall, under the roof eaves. 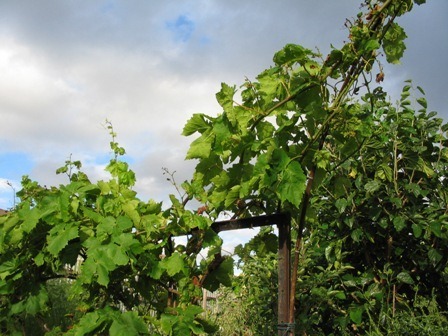 I intend to run the grapevine along the length of the house, where it can grow sheltered from rain, which should eliminate the fungal disease problem, and also shelter the wast wall from the hot sun in summer. Keeping with the trend of irregular weather, summer was extremely short once again, so the growing time was very limited, reducing the yields of the annual vegetables considerably. 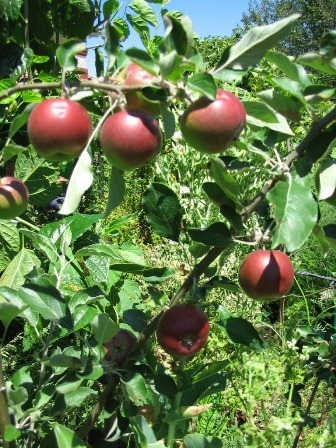 Fortunately, the autumn has been unusually mild, so plants have had some extra growing time and fruit trees have hung on to their leaves a bit longer. 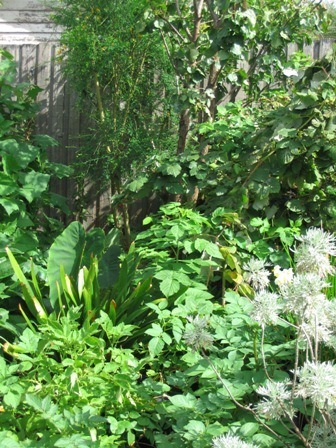 It appears that this has created a greater harvest over the autumn period, and the garden looks rather lush and green well into autumn as you can see in the photographs below. 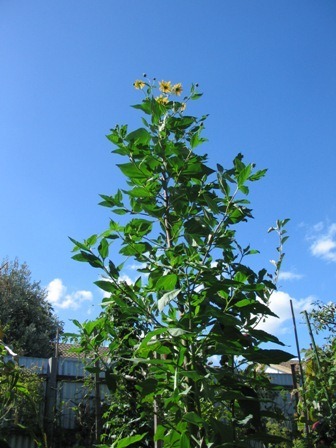 Jerusalem artichoke towering majestically towards the sky. 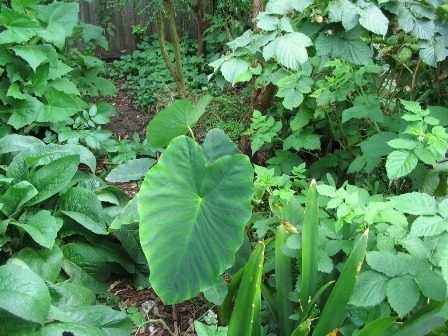 Taro, an edible tuber, with its striking large ‘elephant ear’ leaves, is equally at home in swampy ground or in a moist garden bed. 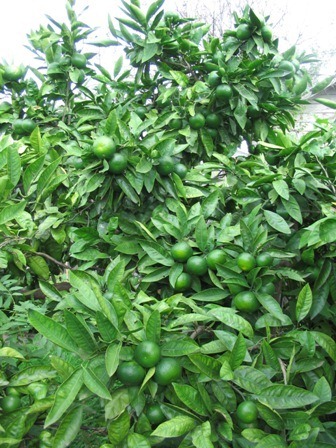 Mandarin tree heavily laden with unripe fruit. 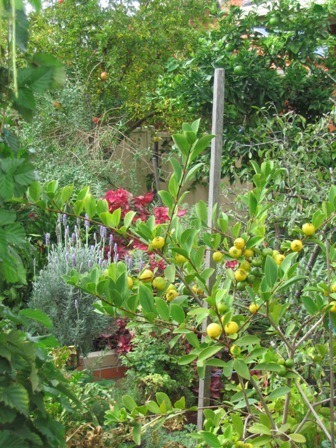 Lemon guava (yellow guava) fruiting for the first time, yielding approximately 2.5kg of delicious subtropical fruit. Cherry guava (strawberry guava) fruiting for the first time also, and matching its differently coloured cousin, also yielding approximately 2.5kg of delicious subtropical fruit. Harvest of raspberries (top left), lemon and cherry guavas (top right), and goji berries (below). 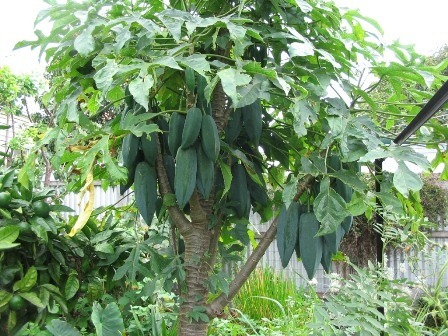 Yet another subtropical fruit tree, a babaco (champagne fruit), cousin of the papaya (paw-paw), heavily laden with fruit. 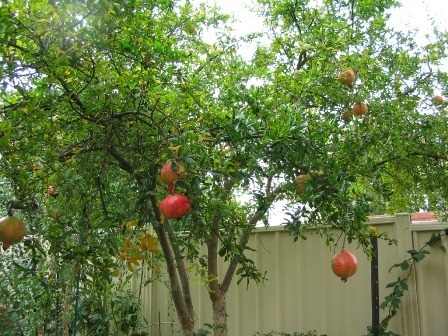 Pomegranates ripening to a deep red colour. Devil plant in a pot serving as a natural shelter for some of the local wildlife! Ahh, it’s all too much!!! Wow, sorry to see those trees fall down! Out of interest, how do you stop birds from eating all your fruit? I don’t see any nets in the photos. 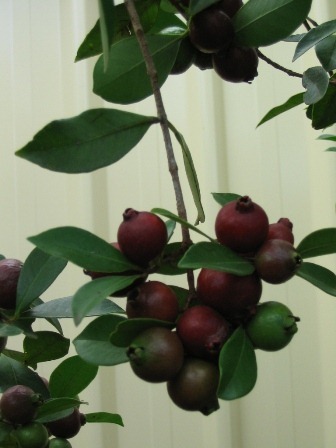 All my strawberry guavas get eaten by parrots and rosellas if I don’t net the tree. Same for figs and raspberries. 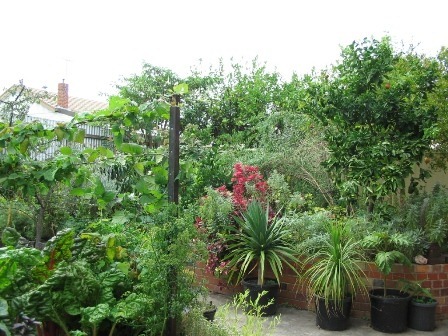 Hi Darren, I found that by keeping my trees short, roughly as high as my arm can reach with a pair of secateurs, say 2.1m (7′), maybe a bit more, around 2.4m (8′), birds feel really unsafe that low to the ground, as do fruit bats and possums. They prefer to feed in the really tall unmanaged fruit trees in other properties rather than risk it, it’s just their instinct. Having three cats that are well fed and therefore don’t harm the birds also creates an effective deterrent. 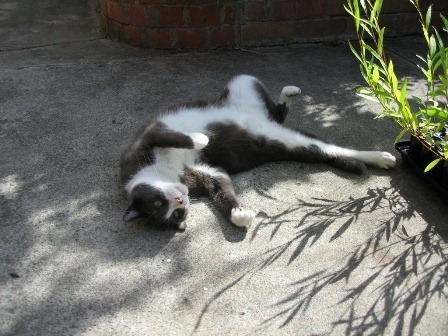 They are my ‘Permaculture cats’ – they occupy the ecological niche of small predators in the food forest ecosystem, controlling rodents the occasional insect. 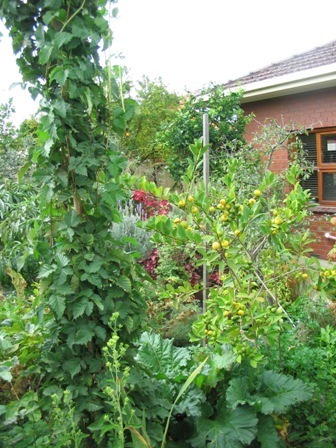 They deter some birds from eating the produce, and make great pets, so they serve multiple purposes like any element in a good Permaculture design! By the way, I like the idea of sharing abundance, so I do intentionally run a berry cane or two really high to feed the birds, or leave some fruit on the highest branches for them to eat too. The only instance of fruit losses was to a flock of little rainbow lorikeets, these small, noisy and amusing colourful parrots are winged hooligans, but they are amusing to watch, their antics are captivating. For some reason they took a liking to one of my four varieties of apple trees, and they would chew up the occasional apple while performing an entertaining show that the cats would sit watching, transfixed, like preschool children watching a puppet show. These little parrots are quite tame and let humans get real close too. After they claimed about a dozen apples, I grabbed a length of bird netting and tossed it over the tree – since I keep my trees short it took only around two minutes to cover the tree, and that foiled the little parrots, which seemed quite upset after that, but did not touch anything else. Basically, that’s the only time I’ve ever had to net anything, and it was effortless. Thanks for the tips. I guess I was hoping for a silver bullet solution :-). We get pounded by birds. 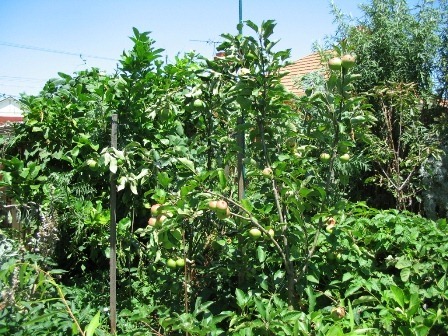 Ours don’t seem to care if the fruit is high up or low on the tree, nor whether the tree is tall or short. We’re in a rural area – maybe birds in suburban areas learn that behaviour after encountering their first few backyard cats or dogs? I’ll never keep cats, but I’m hoping our new dog might help chase birds off next season. Fingers crossed! oh my god…i love all that fruit…hope my little house have that big garden of fruit….